To start, put 12 quarts of cold water in a 12- to 14-quart stock pot. (If you do not have one this large, you can use two pots.) Add roughly chopped onions, five bay leaves, the top half of a bunch of celery (leaves included), five large carrots roughly chopped and one small can of tomato paste. (Do not discard the bottom half of the celery; save it for the actual soup.) Bring to a boil and then simmer for about two hours. Drain and set liquid aside; discard the vegetables. You can do this days in advance or the day served. If you make the stock a day or two in advance, let the broth cool before refrigerating. A couple hours should be sufficient. If using the day of, there is no need to set aside. In a 12- to 14-quart soup pot, heated to medium-high, add the olive oil, garlic, onions, celery and the bell peppers. Sauté approximately 10 minutes, or until this mixture turns translucent. At this point, add the vegetable stock and tomatoes. Bring to a boil, cover, and boil for 20 minutes. Add the carrots, zucchini and green beans. Cook for 10 minutes and then add the spinach (I like to have substance in my soup so don’t chop the spinach. If the leaves are too big, tear them in half), basil, parsley and beans. Simmer 10 minutes and check the seasoning. Add salt and pepper to taste and the oregano. 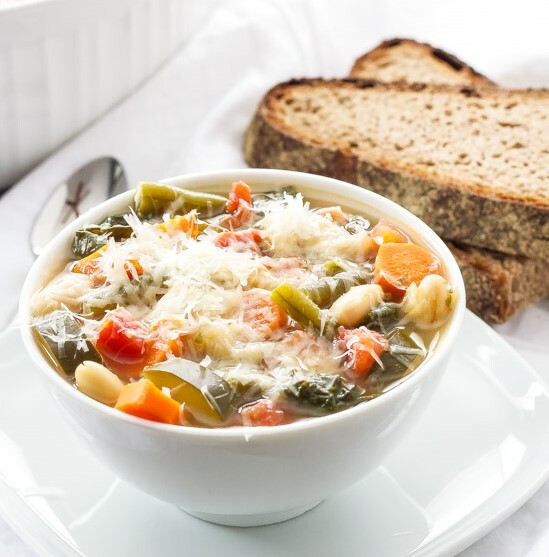 Serve in soup bowls with Parmesan sprinkled on top. If you choose to serve a salad, the typical Italian salad will have sliced radish, fresh tomatoes, thinly sliced red onion and fresh-blanched green beans with a light vinaigrette dressing consisting of a touch of basil, two cloves of garlic, a good red wine vinegar and extra-virgin olive oil (use three-quarters oil to one-quarter vinegar). With all of this, it is typical to use romaine lettuce or a combo of romaine and radicchio or leaf endive. Put the ingredients in a bowl with a handful of freshly grated Parmesan cheese, salt and pepper. Toss, and, voila, it is ready. My wine recommendation for this meal is either a nice chianti or a Sierra Foothills Barbera. From the Sierra Foothills, try a Youngs Estate Barbera or a Sobon Estate Barbera. As for a chianti, try Chianti Classico, Isole e Olena. Although I have made a recommendation, I don’t know what the local wine merchants are carrying so by all means check with our friends at Ben’s Liquor and Aloha Wine and Spirits for their selections.